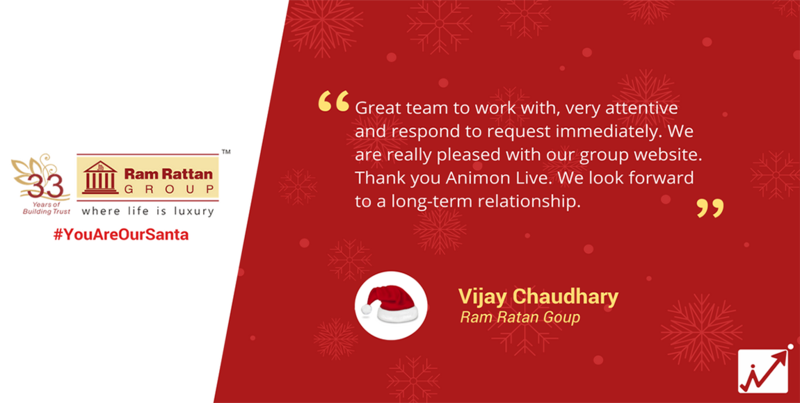 Our Santa for the Day 07 is Ram Ratan Group. Initiated 33 years ago, the Ram Rattan Group has carved a niche for itself in the contemporary reality industry. Since three decades, the group is relentlessly working on its vision of colonizing Delhi NCR, Haryana & Rajasthan. The primary objective of Ram Rattan Group can be summed up in gain for investors/business entities by means of capital appreciation, continual profits and high returns from investment. Powered by industry experts, Ram Rattan Group offers a wide range of services to investors interested in Indian real estate. Our experienced consultants in Delhi and across the country meticulously follow a set of stringent guidelines and adhere to a proven analysis process with focus on such significant details as income, ROI & tax benefits; expenses & depreciation; affordability and future profitability.